"Spring is in the air! 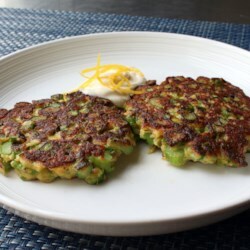 These delicious patties are a new and exciting way to enjoy asparagus. Garnish with lemon aioli (see Footnote) and fresh lemon zest." Bring a pot of well salted water to a boil over high heat. Trim off up to 1 inch of the woody bottom parts of the asparagus. Cut asparagus in half if necessary to fit your pot. Transfer asparagus to the boiling water. Boil until slightly tender, 2 to 3 minutes. Transfer asparagus to a bowl of very cold water using a slotted spoon. Let asparagus cool completely. Grate Pecorino Romano cheese finely using a rasp grater. Drain asparagus well and slice into very small pieces. Place in a bowl; season with salt and pepper. Add cayenne pepper, grated Pecorino Romano cheese, and bread crumbs. Mix in 1 egg to start. Add the second egg and continue mixing until well combined. Heat olive oil in a skillet over medium heat. Scoop some of the asparagus mixture into the hot oil; flatten with a fork. Cook until bottom is browned, about 4 minutes. Flip over and brown the other side, about 4 minutes more.